A rustic, High Sierra camp providing girls with outdoor and backpacking skills, independence, leadership, and fun since 1936. **Fireflies arrive 2 days earlier for each session. Public camper registration begins Sun, Feb 3 at 9AM Pacific. Two Sentinels is part of the Girl Scouts of Northern California. Don't think this is the camp for you? We'll miss you, but check out these other amazing summer camps! 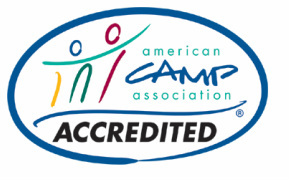 Two Sentinels is accredited by the American Camp Association. The Two Sentinels web site was originally developed by Furble for her Gold Award in 2003. "This camp has been a wondrous place for me, and I hope this site inspires others to join the thousands of girls who, for over the better part of a century, have walked the paths, swum the lakes, and sung the songs that bring Two Sentinels into your heart."